You probably have several particle accelerators in your home. They are often pointed at you. Follow the photos on this website as we guide you through a household electron accelerator, a television with a picture tube. Flat panel televisions do not have accelerators in them. Oscilloscopes in science laboratories also have electron accelerators inside them, if you have access to an oscilloscope you can do some additional experiments. Do NOT open up a television yourself! There are high voltages present even when the set is turned off and unplugged. In addition, the picture tube is a glass vacuum-bomb. If you break the glass the tube will implode sending glass fragments in all directions at high speeds. 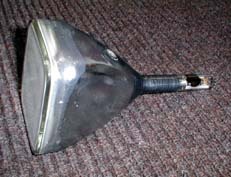 Inside a television you will find a picture tube like the one pictured below. Large and flat at the front, narrow and tubular in the back. 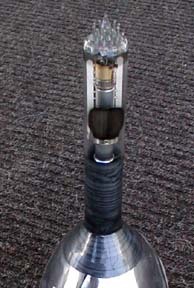 Wires attach to a socket at the rear of the tube. Looking at the electron accelerator. Close up, you can see the loop of wire that is the filament in the center of the gold colored cylinder. Inside the picture tube there is a vacuum. there is also a complex structure at the back of the tube. In this structure, there is a filament of tungsten wire. An electric current flows through this tungsten wire heating it to incandescence. Electrons come out of the hot wire. In an accelerator, just as in a television picture tube, there is a vacuum. Electrons or protons are injected at the starting end of the accelerator. Protons come from hydrogen gas the H2 molecules are split apart and then the electron is removed, ionizing the hydrogen and leaving a naked proton. Electrons come out of a heated wire. Near the television filament, there is a target, a metal plate with a hole in it. The plate is kept at a high positive voltage, 10,000 volts or more above the filament, electrons accelerate toward this target gaining speed until they are traveling at a good fraction of the speed of light. They then pass through the hole in the plate. The kinetic energy of an electron is measured in electron volts, eV, one electron accelerating through 10,000 volts has 10,000 electron volts of energy, a.k.a. 10 kilo electron volts or 10 keV. An electron volt is a small unit of energy, 1 eV = 1.6 x 10-19 J. In an accelerator the initial acceleration can also be done using high voltages. Perhaps you have seen the ball of a Van deGraaf generator at school or in a science museum where they are used to add electric charge to people raising them to a high voltage perhaps 30,000 volts, causing their hair to stand on end. Similar high voltage balls are used in professional accelerators to raise the kinetic energy of the electrons or protons to a million electron volts. Accelerators also use the high voltage metal plate. Coils of wire wrapped around the beam of electrons in a television make magnetic fields which focus the beam to a small spot when it strikes the screen. In the accelerator, magnetic coils play these same two roles. Magnets shape and focus the beam and also bend the beam. In a circular accelerator magnets bend the beam into its circular path. Magnets also bend the beam to the side to direct it into experimental study areas. The accelerator, unlike the television, continues to accelerate the electrons throughout their path. The kinetic energy of the electrons or protons increases as they pass through the accelerator. 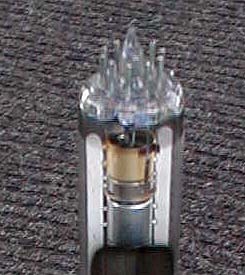 The electron beam in a television ends by colliding with the phosphor coated inside of the front face of the tube. The electrons deposit their energy in the phosphor, the energy is turned into photons, particles of light. These photons were created from the kinetic energy of the electrons. Your eye detects the photons. Your eye can analyze the photons and determine things like where they came from on the screen and their color. In front of the picture tube is a thick piece of glass, this glass absorbs any stray x-rays produced when electrons suddenly come to rest at the front surface of the television tube. In the accelerator, the electron or proton beam is collided with a target, often a piece of metal, sometimes a head on crash with particles from another beam. The electrons can scatter from the resulting collisions and their kinetic energy can be converted into new particles. Detectors then measure the properties of these particles. Often the detectors record the paths followed by particles(in the old days this was done in cloud chambers or bubble chambers), they also record their energy (in calorimeters). The target chamber of an accelerator is often surrounded by concrete and dirt to catch any escaping radiation. Both the TV and the accelerator provide us with images, one of Homer Simpson, the other of the fundamental particles that make up our world. Like the television the oscilloscope makes a beam of electrons traveling toward the front screen at a good fraction of the speed of light. The electrons collide with the phosphor and produce photons of light which we see. Turn off the scan of the oscilloscope and center the resulting spot of light. If you have an older oscilloscope there will be a control labeled focus. Play around with this control and notice how the spot of light becomes large and fuzzy and dim, or small and sharp and bright. The control changes the magnetic fields which shape the electron beam inside the oscilloscope. There may also be a brightness control. The brightness control adds electrons to the beam. Often, changing the brightness will change the focus. Find a moderately large magnet, at least 10 cm across, not a horseshoe magnet but a rectangular solid with a north pole face and a south pole face. Before you bring the north pole face down from above the oscilloscope to a point near the front, predict how the beam will deflect. Up? Down? Right? Left? Not? Magnets can be used to deflect electron beams. If the beam doesn't bend you need a stronger magnet or a larger magnet.